What’s wrong with this picture? Nothing — and that’s what’s strange. My Eatin’ Project has for the last few weeks been giving me perfect cos lettuce, proving once and for all that lettuce is a foolproof, quick win for first-time vegetable growers like me. Claire at Plant Passion had commented earlier this year that she is telling everyone to go for lettuce if they have a small space and/or they’re new to vegetable growing, and how right she was. 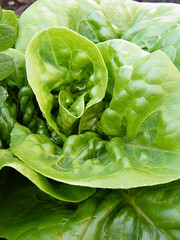 The first time I cut one of these lettuces, I just stared at it there in my hands. I couldn’t believe I had done this — those perfect whorls of green were, well, perfect. The sun was too strong just now to get a decent picture of the potato bags, but they are thriving, wedged between the edge of my tiny greenhouse and the side of this raised bed, which I’ve built up to double height of 12 inches. Crammed in there I have cos lettuce, some younger oak leaf lettuce, and wee rows of Parmex carrots interplanted with White Lisbon spring onions to hopefully throw off the canny carrot fly. There’s also a small pot of carrots nestled in the middle of it all. Strawberries are at the corners and a young Tamina tomato is it at one edge: hopefully I can support it against the tiny greenhouse if needed. Never outside of Tesco’s have so many vegetables been crammed in next to each other; it’s a bright, airy spot, so I’m hoping this density will be productive rather than encourage disease. Interesting discovery: the potato bags do triple duty as potato incubators, a place to put unwanted old compost as I earth up the growing plants, and an unexpected place to germinate seeds. I’d dumped seed trays whose contents had never germinated onto the bags when earthing up: a few of those seeds liked the potato bag better than my propagator and came to life, giving me an extra five or six carrot plants which are now thriving. Go potato bags! Let’s not pretend, however, that my heart isn’t still with the roses and the wisteria, which is looking stunningly fabulous at the minute. 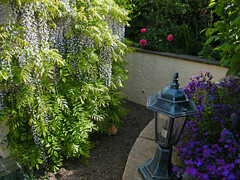 I’ve got a long-standing gripe against J Parkers who sent me the wrong wisteria, which means its racimes are crowded against the wall (W. Sinensis has perkier bunches than my W. Floribunda, and looks better wall-trained); my plant would really rather be doing its dangling thing from a pergola, but I hate to complain when getting a wisteria flower is so hard in the first place. Yet why is it that a huge portion of things I buy mail order aren’t the plant that was marked? I tried not to go mad planting vegetable seeds, but I do need now to find a sheltered place for rather too many purple sprouting broccoli plants, which are overdue to put their feet into the ground. Move over, roses, here come the brassicas. Yes, I’m doing it, though I’ve read a dozen times that I shouldn’t. But I really want to go old-style: I want the lineup to be a nod to old New England colonial front gardens, and the painted red-on-yellow of these single earlies to lend a Rembrandt vibe. They’re Mickey Mouse and I haven’t grown them before, but they’re now in a double row under my office window. (Digging a trench for the tulip lineup was also a much faster way to work — in they went, each nestled on a bit of sand.) It’s the squat gable end of the cottage, which supposedly dates to the 1600s, so the whole combo should look righteously retro. The antique rowans overhead should be blazing with blossom by the time the tulips are over and distract from their decline.